Most of us are a little bit self-involved. It is a necessary aspect as we all need to value and love ourselves. But narcissism is taking that to the next level. For narcissists, the whole universe revolves around them. They fully believe that they are superior to everyone else in every way possible. It’s not easy to argue with them or even to spend time with them as friends. They have no concept of teamwork and hardly ever bother to listen to others’ opinions, even if they prove their own opinions wrong. They crave attention and it is as necessary as breathing for them. They like to maintain a crowd of yes-men around them to fawn on them and go along with whatever they wish. If need be, narcissists can and will manufacture drama and intrigue around them so that they will not lose their spotlights and others will continue to be interested in them. They cannot handle or respond any form of criticism. Narcissists often cannot see their own flaws and this often distances them from other people. 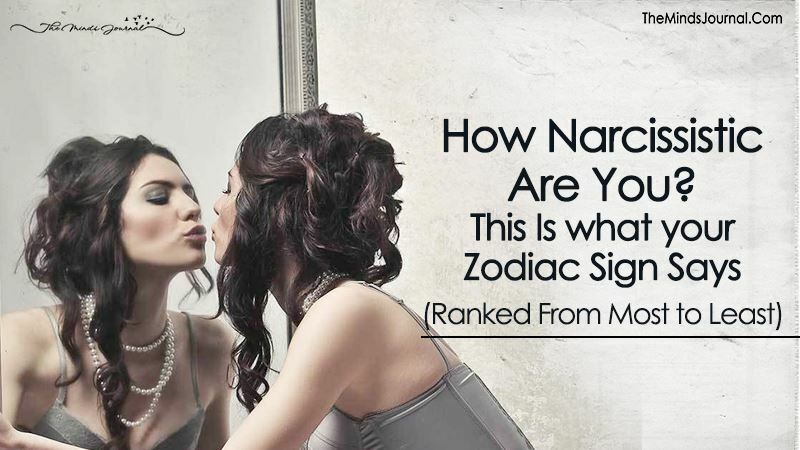 Interestingly, your zodiac sign can determine how narcissistic you are. Leos tend to be quite sure of themselves, bordering on being know-it-alls. They are terrible at working in tandem with others. They strongly believe that their opinion is correct and will never settle for a compromise. They are very self-indulgent. They will do whatever it takes to get what they want without caring if the people around them are being affected negatively in the process. Scorpios are very nice people if they’re in a good mood. They’ll be some of the best and brightest people you can hope to meet. But there is a flip side to them. An angry Scorpio can and will be very rude and hurtful to those who are the cause for their anger. They lack empathy and don’t usually care what others are going through. They view the world in black and white and just want to achieve good results. Often self-serving, it’s hard to pinpoint an Aquarius as independent or narcissistic. They will sometimes stick up for people around them but only if it benefits them. They are materialistic and worldly. They wish to be rich and famous and will do even cruel things to achieve that. Don’t get close to them because when you are no longer of any use to them, they will not hesitate to cut you off from their lives. Virgos are true narcissists. Like the original Narcissus, people born under this sign are completely in love with themselves and no other person can come in the way of that. They don’t require anyone else’s approval or affection. Virgos will go on and on about their own lives for hours without worrying about the other people in the room. Even the slightest discomfort or irritation is unbearable for these people and they will simply leave. They are irritatingly fussy sometimes. They will not sacrifice any part of their comfort for someone else. If it ever looks like an Aries is helping out someone else, be warned that they probably have some ulterior motive that is for their own benefit.